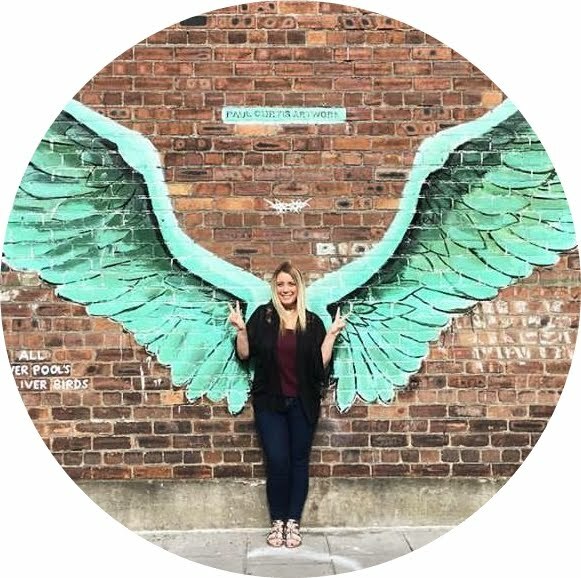 We crammed so much into the week that one blog post just wouldn't have been enough, so I have decided to split it into 6 or 7 different ones, one for each day we were there. 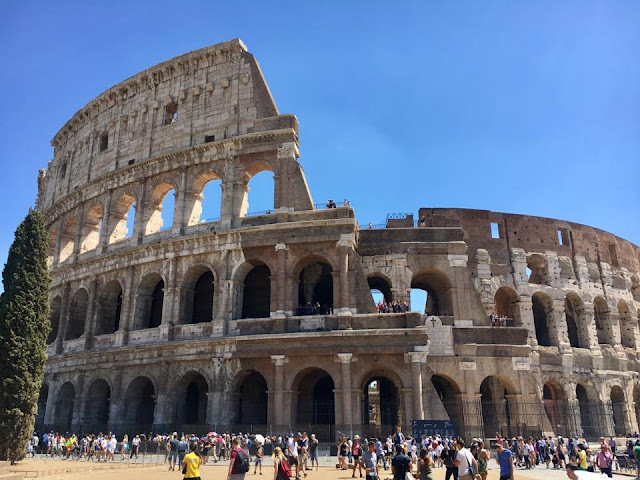 We spent a couple of days in Rome exploring the city and all its beautiful sights, a day in Venice, a day visiting Pompeii and Positano, an afternoon visiting the leaning tower itself in the cute little city of Pisa and a day in the city inside the city, the Vatican City. This first blog post on the trip though is all about our first day there spent in stunning Roma. 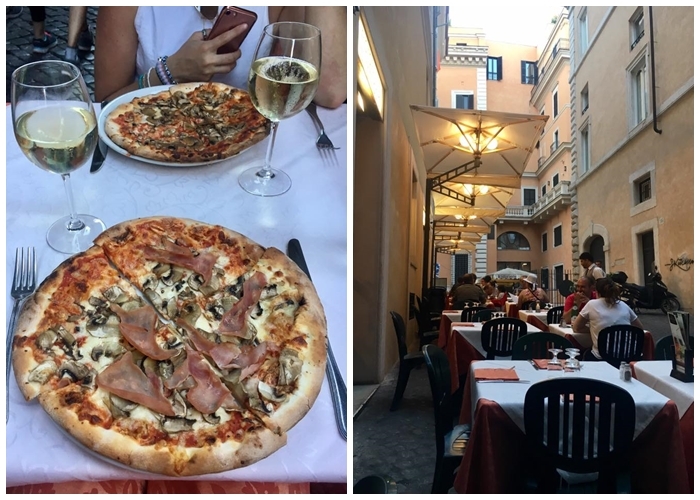 We based ourselves in Rome for the week and chose our hotel based on trip advisor reviews and cheap deals on booking.com, and we ended up choosing Domus Sessoriana which was an absolutely beautiful and picturesque hotel based in the Piazza Di Santa Croce in Gerusalemme area of Rome. BE WARNED: Yes, this hotel is beautiful inside and out. No, we didn't have any trouble staying there. It is cheap to stay in, the staff are amazing, friendly and extremely helpful, the rooms are clean and the building is wonderful. It is an old Monastery and you sleep in the converted Monk's chambers. It's so unique and eye-catching and like nothing I have ever stayed in before...BUT I don't know who has reviewed this hotel when they say the location is good and walking distance from everything because it is so far from all the tourist attractions and definitely not in walking distance from anything. I can't even stress enough how bad the location is if you are planning on walking everywhere like we were. Even on the official website it states the hotel is close to main attractions, but it isn't. It's a 45 minute walk to Termini train station and a good hour or more to the Colosseum. To the Trevi Fountain it would be a good hour and a half one way! Everything is easily accessible by Metro (although just our luck, it was having maintenance work carried out on it the week we were there and it was closed all week!) or Tram but we didn't figure this out until half way through the holiday and wasted so much money on taxis to Termini when the tram and metro is only €1.50 for 100 minutes use or €7 for a 24 hour ticket and can be used on both. It was an absolute gem of a hotel though, and would have been perfect in every way, we just really wished the location was better. The first morning we got there we got up and got ready, went down for breakfast which we had in the hotel. It was your average and basic continental breakfast. Bread, meat, fruit, cereal, biscuits, it was OK. It was the only time we had breakfast in the hotel because our schedule was so tight we just didn't ever have the time. After Breakfast we made our way to the Colosseum. To say I was excited was an understatement! 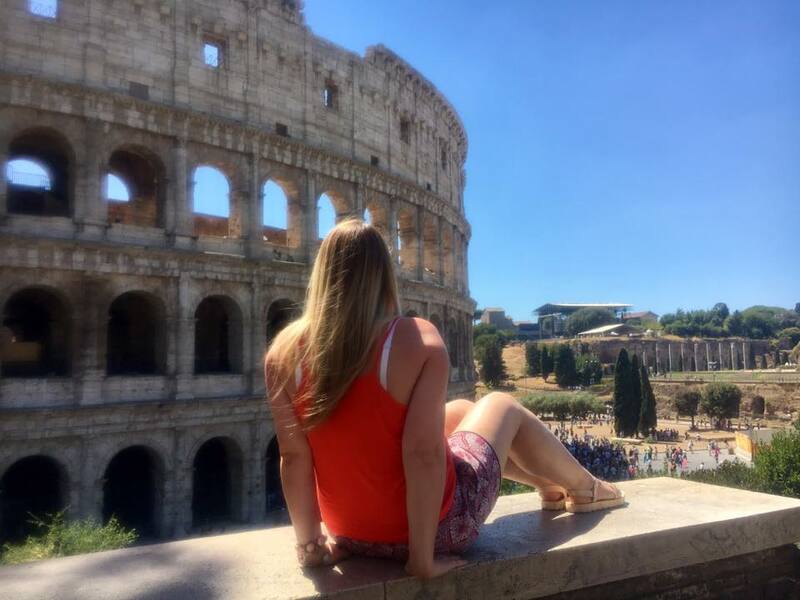 The Colosseum is one of the most famous and most visited places in Rome and I had wanted to visit it for so long. The moment when we pulled up in the taxi and the giant building came into view was definitely one of those pinch me moments. It's one of those, where you see pictures for so long and you think wow it looks unbelievable, and then you see it and everything you thought it would be it is, and more! Am I actually here looking at this? Is this building actually in front of me? And it was! Right there, infront of my eyes looking back at me. Wow, what an amazing moment! We booked skip the line passes online before we left which were a couple of Euros more but I HIGHLY recommend them. The queue's were absolutely insane, and this was at 10:30am, so still really early in the morning, and the queues already looked like they were a good couple of hours long. With these passes we whizzed right past everyone (which the smug Sarah in me rather enjoyed) and within 5 minutes we were inside! When you get into the Colosseum it's hard to fathom that thousands of years ago this was home to Gladiator fights, ship battles, celebrations, deaths, and that hundreds of thousands of Roman's including the famous Emperor's you hear about, had walked in the very same places that you were walking all those years later. It was mind blowing when you stopped and thought about it. 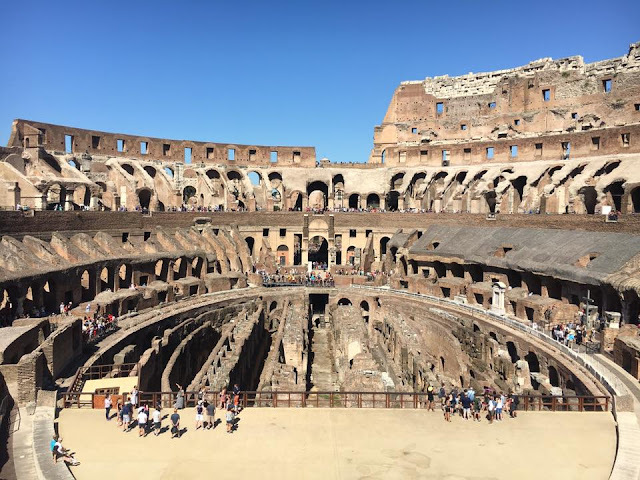 When you walked around the inside it was very crowded but so surreal walking around taking it all in, but it's not until you walk into the centre of the Colosseum and come face to face with the arena that your breath really gets taken away. 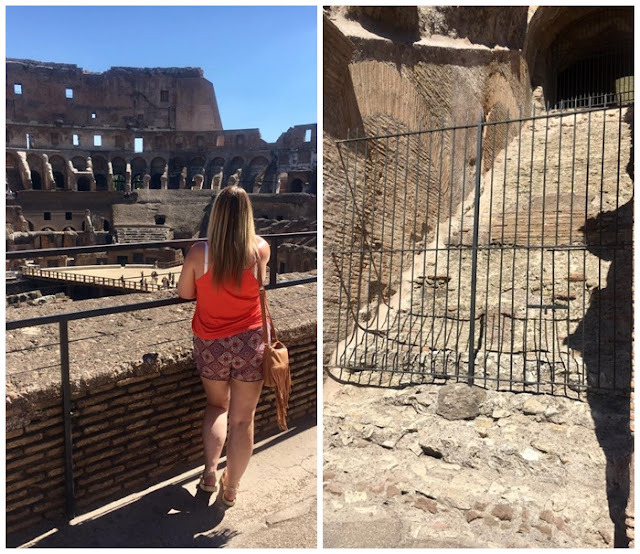 You can still make out everything, like where they used to sit, and the staircases are still visible (although cordoned off with railings), and when you look around it's hard not to picture what it would have been like all those years ago and imagining all the people cheering at the gladiators getting slaughtered infront of their eyes. There's a cross marking the spot where the Emperor used to sit and when you look at the ground you can see the tunnels on the floor where the gladiators where kept which would have been hidden, and the door is still there which the animals used to be lifted into the arena through. It's just crazy seeing it all with your own eyes and thinking how much the world has changed since then. It really got me thinking, I wonder in thousands of years what people will be flocking to see from this day and age. Will they all be excited to see Anfield where Liverpool used to play their football matches and it's just a crumbled ruin in the middle of the city? Will they be swarming to the Albert Dock still? Or to old arenas to see where all the biggest acts used to play their concerts and all that's left is a shell of the arena with a stage in the middle? Probably not, but I bet they never thought all these years in the future people would be coming in their thousands day in day out to see the amphitheatre where they used to spend their afternoons chilling in the sunshine watching people die. It is a crazy thought. Annnnd I'm off on a tangent. After we walked around the Colosseum for a good while, took lots of photos and battled through the crowds, we went for a drink and lunch in a cute little cafe facing the Colosseum called La Viga, where I had the nicest Tomato, Mozarella and Basil Panini ever and enjoyed our lunch looking out at the magical view in front of us. Absolute lunch goals or what! 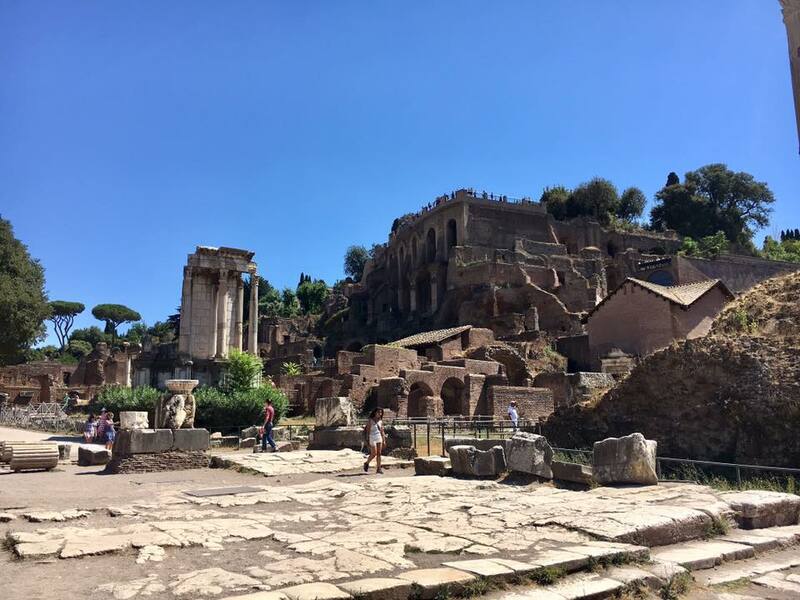 Then after lunch, we made our way up to the Roman Forum and Paletine Hill. 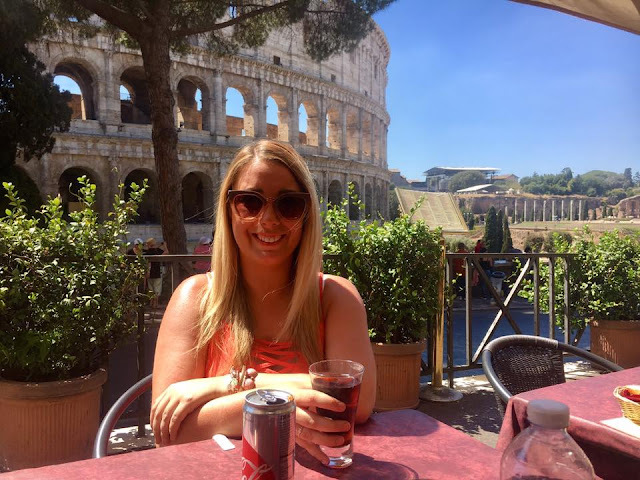 Rome is a crazy city. Everywhere you turn, there's ruins. You could be walking down a street with a McDonalds and a Burger King on it, and at the end turn a corner and there's a 4000 year old ruin just there in front of you. It's mental. I didn't really know what to expect from the Roman Forum. I had seen photos and it looked amazing, but I wasn't sure what it would actually be like. When we got there though it was so cool. It was a hell of a lot bigger than I was expecting as well. 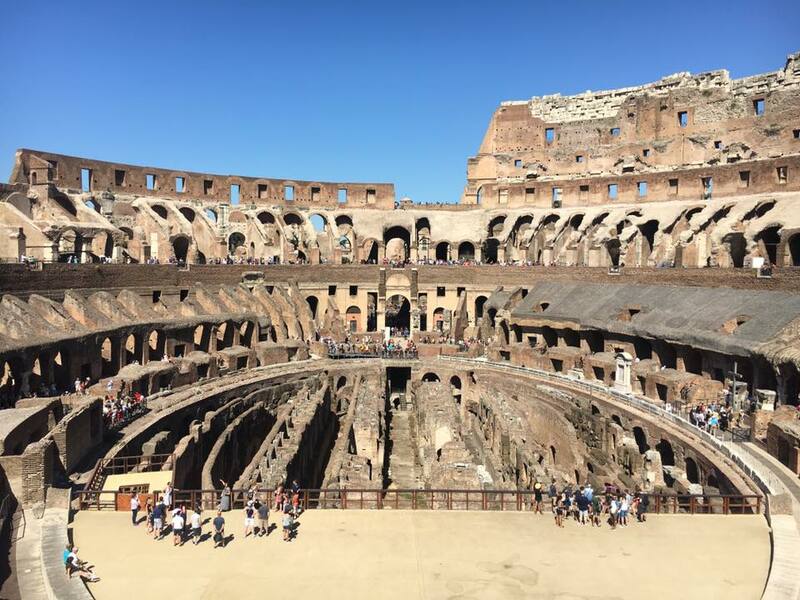 The passes we had for the Colosseum were also usable for the Forums so we didn't have to pay again. 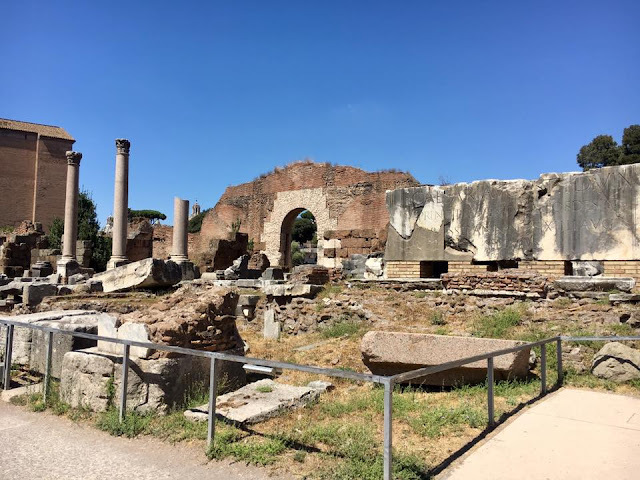 When you are in there, you see all kinds of ancient ruins from old Goverment buildings, to Temples, to looking out onto the Circus Maximus, the Chariot Racing stadium. 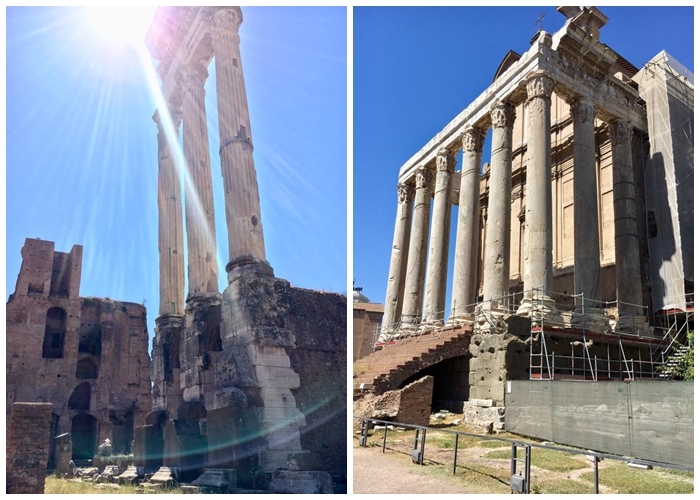 We were getting photos up on Google Images of what the ruins used to look like and the comparison was crazy. When you look at the ruins they have been excavated so well and the fact that after all these years, 4000 year old columns off buildings are still standing as high as the birds, it's brilliant to see. It's just strange to think that you are acually walking around where Julius Ceasar would have been walking. The sun beaming down made walking around this really tough going, hence the hair getting thrown up into a messy bun (which it stayed in for the rest of the week thanks to the 40 degree heat pretty much every day haha), but the sun shining down on it all made it so much prettier than if you were to visit at a different time when it was dull and miserable. 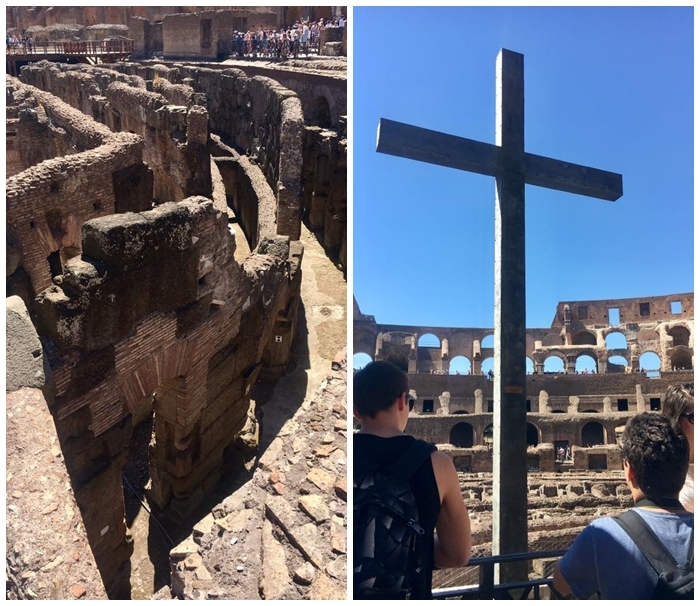 This is actually just sitting there in the middle of a busy and bustling Capital City, it's such a unique and beautiful thing to see and I highly recommend anyone to visit if they ever go to Rome. After we had left all the ruins behind we made a quick visit to the Trevi Fountain and the Spanish Steps (more on those in a later blog post!) and then we headed to get some food. We had both brought lots of makeup and spare clothes to change into for the nighttime but because it was such a mission to get back to our hotel and it was so hot, we just decided that we would stay out in what we had on and that was the same for the rest of the week to save all the messing around. 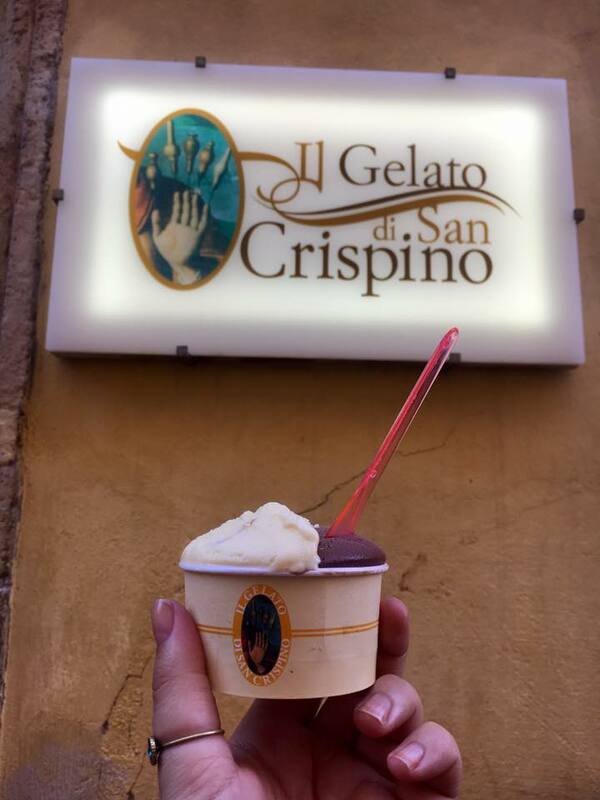 After we had our dinner we decided to head to one of the most famous Gelato shops in Rome, San Crispino. Stacey had been before a few times and she said it's the nicest Ice Cream she had ever tasted so I was seriously excited to try some. Me being me, opted for the really exciting and daring flavours of Chocolate and Vanilla, I know right, WHAT a rebel! But I can't even express in words properly how good that Ice Cream is. It genuinely is the nicest ice cream I have ever eaten and over the week we tried a couple of other places which were up there, but didn't just manage to beat this place. If you are ever in Rome, it is definitely a must for any sweet toothed traveller looking for some amazing Gelato! After stuffing ourselves with Pizza and Gelato we wandered around the shops for a couple of hours and then took a stroll back to Termini Train Station where we got a taxi back to our hotel and we had an early-ish night ready for a very early start the next morning where we headed to Venice for the day! That will be the next blog post in my Italian Adventures and it's definitely one for those who love a good beautiful photograph! Venice is probably one of the most beautiful places I've ever seen and dare I say it...I preferred it to Rome! That will be coming soon! 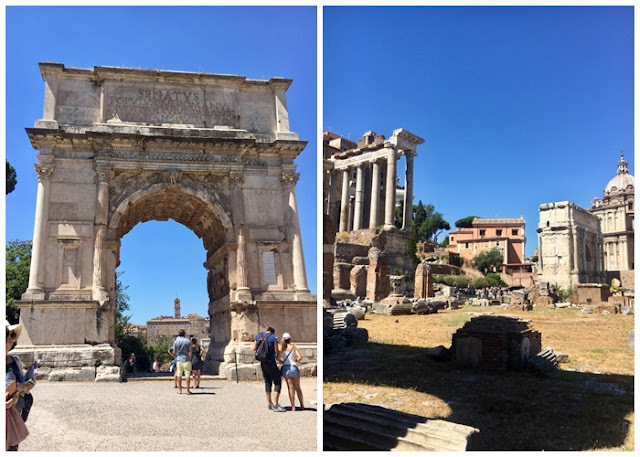 On first impressions and over my first day in Rome, it was an absolutely stunning city with so much history and so much to do. 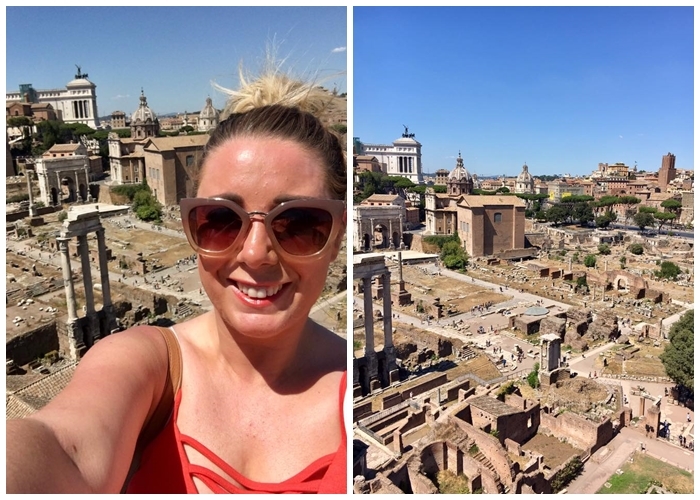 I absolutely loved it from the get-go, although the heat definitely nearly killed me off. I said from day one if I ever return to Rome again, I will definitely go when the weathers a bit cooler, but after exploring on the first day I thought it was an amazing place and I was so excited to see what the rest of the city had to offer!